Is Bitcoin Cash a "legitimate" crypto-currency? Several weeks ago we announced support for Bitcoin Cash as part of our response to the situation of inordinately high fees for Bitcoin transactions (a situation we consider to be temporary and of the “growing pains” ilk). Those remedies included zero confirmations for existing members in good standing, and we adopted Bitcoin Cash as a payment method. After all, most everybody who had been taking part in the Bitcoin economy for any length of time were likely to be sitting on BCH as a result of the fork, and if they weren’t into it, why not provide a useful outlet for it? Given the alternatives, like Stripe ending support for Bitcoin for the same reason that had us adding Bitcoin Cash, providing more options to address a problem seems preferable to removing them. After we did that, we started seeing a few references around the net to this move along the lines of “hate to see a company like easyDNS ‘legitimizing’ Bitcoin Cash”. Nothing over the top, not the “point-and-shriek” histrionics you get from the snowflake brigade for having a customer who’s CTO once retweeted a politically nonconforming meme or anything like that. But I wanted to touch on this briefly because this type of attitude “that Bitcoin Cash is illegitimate” misses a major point of just what exactly was accomplished in the BCH hard fork. Note that I say all this as an outsider and was not privy to what transpired behind the scenes. What I think is important about the chain of events that led to the hard fork that begat Bitcoin Cash was that two opposing sides of an issue developed very deeply held convictions around “the right way to move forward” and there were irreconcilable differences in doing so. As a result, those that could not bring themselves to maintain the current consensus around the scaling issue “forked off” and decided to try it their way, on their own. Keep in mind, we’re talking about an open source project, which in practice means that there will in all likelihood be forks and owing to the nature of open source those forks are by definition “legitimate”. Each side acts within their own prerogative to move forward according to their own vision. Whether one side or another ultimately wins or if they settle into some type of co-existence, or any variation between becomes a contest of market uptake. It is important to note that not a single shot was fired nor a bomb dropped. That’s civility. That’s competitive consensus in action, that’s conflict resolution that looks a lot more democratic than anything else I’ve seen in my lifetime. As a DNS provider, we tend to look at things fairly agnostically – we try not to make technological pronouncements: our job is to provide the tools and it’s the customers’ requirements that decide which ones get used. When we do see a situation that looks problematic we do of course look at what we can do to remedy it. When we analyzed the transaction fees of customers paying in BTC we thought we could alleviate that (it wasn’t nearly as bad as some of the hysteria we’ve heard around it, but it pencils out to around 10% of the gross amount of the transaction). Is Bitcoin Cash even being used? Yes. 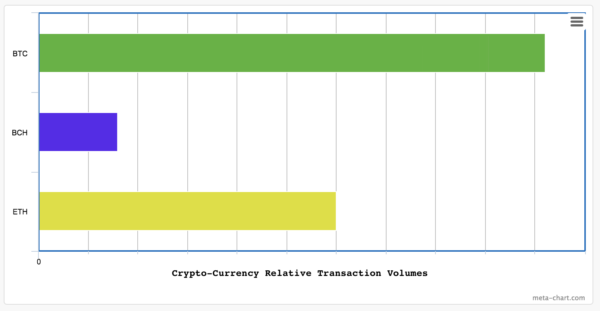 The chart below shows the relative transaction volume of the three crypto-currencies we accept. Bitcoin still the leader, Ethereum running a respectable second and BCH bringing up the rear but I will note that we had more transactions in BCH our first month accepting it than we did our first month accepting Bitcoin (granted, that was back in 2013). Bitcoin will probably solve the scaling issues, at this point it is looking as if that will happening via Lightning, Let’s Talk Bitcoin’s podcast this week had a good overview of where that is. Bitcoin Cash is probably here to stay. I will admit misjudging it at first, to the point where we dumped most of our BCH in the $300-$400 range, which obviously doesn’t look like our sharpest move in the rearview mirror. Then there’s Ethereum, we here at easyDNS are very interested in Ethereum because of the work going on with the Ethereum Name Service initiative. We’re involved in that process and excited by it. Watch this space for some news there. The pattern above? 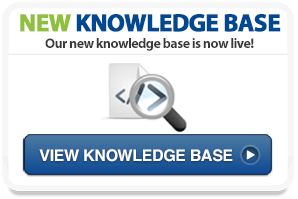 Different crypto-currency technologies are going to occupy different niches and they are all “legitimate”.